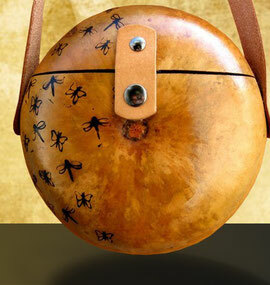 The artwork on this gourd bag is truely amazing. 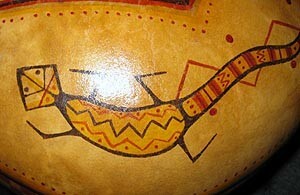 The larger gekko is on the front and a smaller one is on the top. We even added a brass accent gekko to add an additional touch. 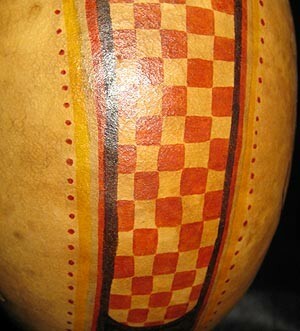 This gourd is accented with artwork around the sides including a checkerboard pattern...its special. We loved making this bag. 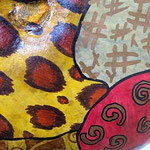 We divided the gourd in curvy sections and adding interesting designs and shapes. Getting the color combinations to work well together was fun. We love this one and so will you. 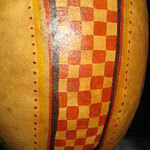 We did our zebra gourd handbags our way because we stained the body of the bag walnut instead of painting it white. We randomly painted our stripes black and bold. 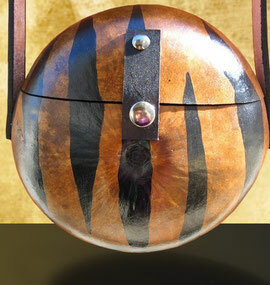 Although zebras are on the endangered list our zebra bags are zany and beautiful. This gourd handbag design is bold, you can call it a Cougar, Panther or Cheetah. 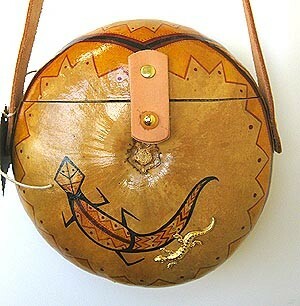 whatever you call it the animal print on this bag is fabulous. 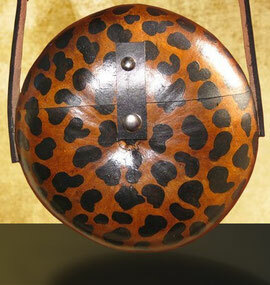 We used a Walnut stain for the background and hand painted the spots in black to give this bag a true feline look. 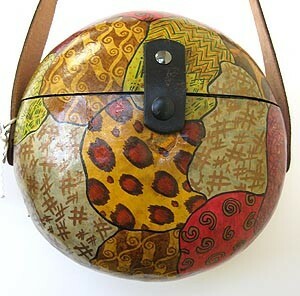 This gourd handbag design is bold. You can call it a Cheetah, Cougar or Panther. Whatever you call it the print on this bag is fabulous. 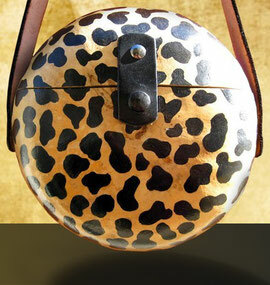 We kept a natural background and hand painted the spots in black to give this bag a true feline look. "Can't you just hear the call of the wild? 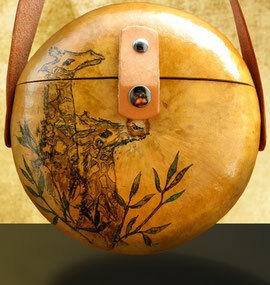 The twin giraffes are hand drawn on this handbag using eco friendly dyes. We captured the essence of this animal with its long neck and blotches of color. To complete the art work we added scattered branches. This gourd handbag is filled with Cultural myth and lore. To honor the butterfly as a symbol of transformation because of its impressive process of metamorphosis we put a pure copper butterfly finding on this warm dark brown bag and they blend perfectly. 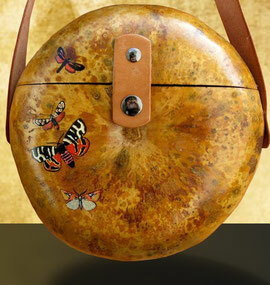 This bag is another bag for butterfly lovers. This family of butterflies appear to be in flight. I love the muted orange against the striking black and white wings. 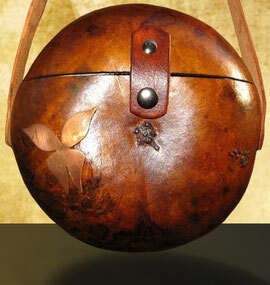 We kept this gourd simple by adding a string of woodburned butterflies and dragonflies. We decided to scratter them along the side of the bag so that they appear to be in flight. 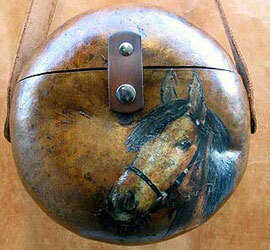 This bag is for horse lovers. 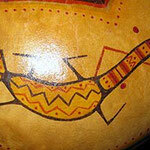 The dark stained gourd has the image of a beautiful horse. The flowing mame and the eyes make this image a true beauty. We used handpainted accents to make hime really come alive.